Fosamax (Alendronate sodium) is FDA-approved medication for the prevention or treatment of osteoporosis in postmenopausal women. In addition, Fosamax is approved for the treatment of women and men with osteoporosis resulting from the long-term use of steroid medications such as prednisone or cortisoneAlendronate sodium is the generic name for Fosamax. Fosamax is chemically known as a bisphosphonate medication. It is not a hormone. 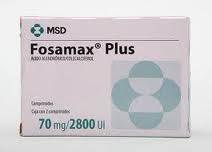 Fosamax works only on the bone and does not affect the heart, breast, uterus, or other parts of the body.